• Also known as “water bears” or “moss piglets,” tardigrades are near-microscopic invertebrates (growing up to 1.5 millimeters in height) with eight legs that thrive in moist habitats. • Tardigrades feed on the fluids of plant and animal cells through several piercing mouthparts called stylets. • They are found all over the world, but Great Smoky Mountains National Park is home to at least 76 species of the micro-habitant, and researchers with the park’s All Taxa Biodiversity Project have discovered 18 new-to-science tardigrade species. 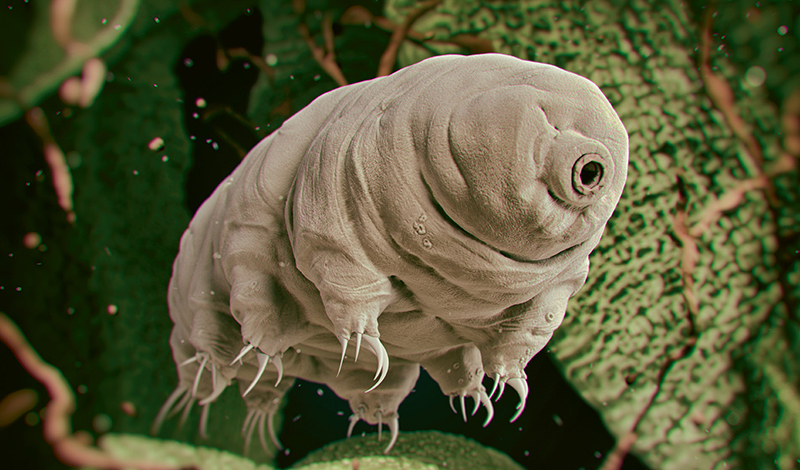 • Radiation, the vacuum of space, boiling liquids, and temperatures as low as -450°F are no match for the tardigrade, which can suspend its biological processes through cryptobiosis—a deathlike state that puts a pause on all aspects of the organism’s growth—until conditions become feasible for regular life. • Tardigrades can live for decades, and they’ve survived at least five of the Earth’s mass extinctions in the last half a billion years.